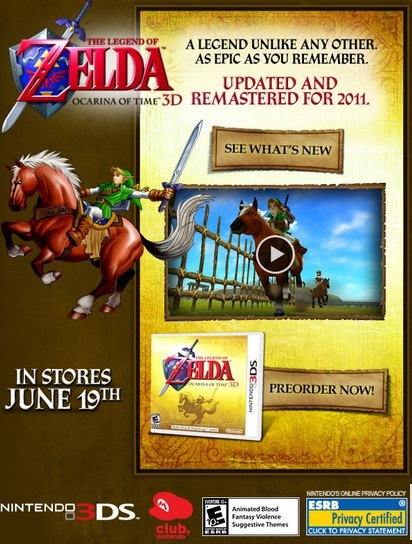 Who isn’t starting to get really excited about Ocarina of Time 3D? Oh… you actually want me to answer that question. Let’s see then… Umm. People who aren’t excited yet are those who don’t know what they’re missing, having never experienced Ocarina of Time before. Thankfully Nintendo knows this too and are giving the classics’s new 3D release a decent push to build hype and attract new gamers. One such method being utilized by Nintendo is the deviously cunning, sinister and shameless e-mail newsletter promotion. Okay, so you’re right, the excitement is getting to me a bit much. Just hit the jump for the e-mail graphic in higher resolution, to get you even more excited (just beware that there isn’t anything new).